Vagus (Goa): Little had changed in the five decades leading up to the early 2000s for Goa’s miners. Discerning buyers from Japan and South Korea bought the best grades of iron ore from miners such as the Salgaocar and Dempo groups. Then China arrived with an eye on the lower grades. Demand for even very-low-grade ores rose so dramatically that people started digging their fields and old dumps to feed the voracious appetite of the world’s fastest-growing economy and the biggest producer of steel. And with it started Goa’s troubles with allegations of overproduction and environmental degradation. More than 50 years of measured mining and disciplined trade ended as operators mined unscrupulously to make quick money, tarnishing the image of the state. “What was earlier a buyers’ market is now a sellers’ market, with even low grades attracting good prices," Salgaocar said, explaining how things changed in the past two decades. 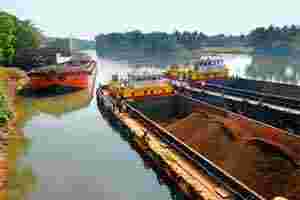 Goa’s mining trade has been a low-key industry with small earnings earlier as its iron ore is of lower grades compared with what is available in other states of India and in Australia and Brazil, Salgaocar said. But in the last few years, China’s big demand for the resource rushed in many miners, who took the trade into a whirlwind of speedy deliveries and high profits. “It’s not as if China is buying junk from Goa. They know exactly what they are getting," said Vipul Sachdeva, managing director of commodity trader Zara International. “China has done this beautiful technology improvement whereby their blast furnace can take 60% iron ore. So they take the 64-65% grades from Australia and water it down with the 48% from Goa and bring it to what their blast furnaces can take." Salgaocar says his group has tried to live up to the ideals of his father and group founder Vassudev M. Salgaocar. “We care for what we do," Salgaocar said in his office in Vagus. “Natural resources have to be nurtured—this is the philosophy my father believed in and we have tried to live up to it." The miner’s early clients were steel companies in Japan, Korea and Europe, and in those days the trade was markedly different with buyers largely being choosy about their consignments and who they did business with. “At that time, buyers were very selective. They expected some kind of discipline," Salgaocar said. “They needed to ensure quality, for which they sent their mining engineers and geologists to study and evaluate mining practices and quality control systems of the suppliers." Resource-starved, Japanese and Korean steel makers planned their expansion well in advance and valued minerals for which they looked for long-term supply contracts and the capability of their suppliers. Goa was important to Japan as it was rebuilding its infrastructure after World War II. Japanese companies, via their trading arm Itochu Corp., financed the infrastructure development in Goa under a barter arrangement for repayment of the loans. In the second half of the 1960s and the early 1970s, they became more selective as mines in Australia and Brazil started up, offering both high-grade and low-grade ores, posing competition to Goan miners, even though its proximity with China gave it a natural advantage. The European buyers also shaped Goa’s miners, though their buying faded away after 1965 with the access to the Suez Canal closed. “Our grades were lower than Australia’s and Brazil’s, and we got only a small share of the business," Salgaocar said. “In the earlier years, because of our lack of infrastructure, we did suffer. Ore used to be loaded even on bullock carts." Still, individual merit did count and Goan miners retained their position as reliable suppliers to the world. China initially came into play in 1992. Prior to that, ore to China was routed through a government-controlled trading company. In 1991, iron ore was put in the open list from the restricted list, which also marked the the turning point in the trade. “I remember going first to China in 1991. China was used to the hard life and the trains that took us from the ports to the steel works would have hard benches," Salgaocar said. China ushered in a different culture. In the earlier stage, Chinese steel makers wanted discounts. But this changed by 2003-04, when the country’s steel production surged and China started paying a higher price. Then came 2005, three years prior to the Olympics in Beijing, when China accelerated the pace of its infrastructure development even more and its blast furnaces could take more of Goan low grades and blend in high grades from Australia and Brazil. “The blast furnace was a phenomenon by itself. In China, it could consume low grades, effectively it could take any mix," Salgaocar said. “It could take in different blends of iron ore feeds including sinter pellets and lump ore of different grades." While demand from China has helped Goan miners to prosper, it has also contributed to the destruction of farmland and had affected livelihoods. Salgaocar, who is also the president of the Goa Mineral Ore Exporters’ Association (GMOEA), admits there could have been errors made by the industry. “Some bit of self-regulation is needed. If there are any irregularities being pointed out, they can always be set right," he said. As a way to deal with the blame on them, Goa’s miners are being transparent with data and information with the authorities. 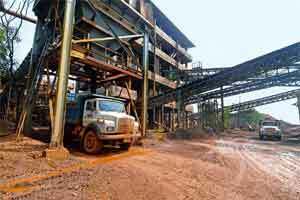 “We just want to lay the facts on the table," Salgaocar said, when asked why the group that has always held a low public profile is now speaking up on Goa’s mining industry when it has reached a crisis point. A reputation for mining responsibly and a history of philanthropy may help Salgaocar’s voice to carry weight. “Everyone agrees there has been a qualitative difference in the last five years," said Claude Alvares, director of the Goa Foundation, which has filed a string of public interest litigation against miners. “For many years, mining has been on on a very low scale. Environmental damage was there, but not gross." Next: An interview of Ambar Timblo, managing director of Fomento Resources.